Livonia, Michigan - June 12th 2015 – Michigan’s iconic Fisher building is for sale! 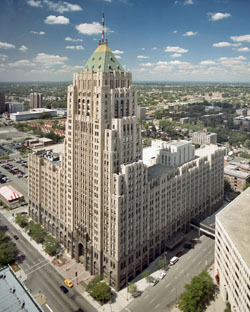 The Borland Group is proud to announce that it will be bidding on the majestic Fisher Building, which is set to hit the auction circuit on June 22nd 2015. Formerly owned by the Farbman Group, the Golden Tower, went into foreclosure this past May. Created by the wonderful genius of Albert Kahn in the late 1920s, the Fisher Building is the seventh tallest skyscraper to grace the Motor City skyline and is considered to be one of the most beautiful commercial buildings ever constructed. Often affectionately referred to as “Detroit’s largest piece of art”, it was commissioned by the Fisher Brothers, who had made a name for themselves in the automotive industry with their innovative auto-bodies. GM, who later brought the brothers out, sported a “Body by Fisher” emblem on their vehicles until the mid-1990s. Primarily utilized for office space, the building also houses a theater, The Fisher Theater, which seats approximately 2,089 guests who in the past have enjoyed renditions of Fiddler on the Roof, Sweet Charity and Walking Happy, just to name a few. The building is located in the New Center on West Grand Boulevard, which is strategic for businesses operating in the metropolitan area as it grants easy access to Downtown Detroit, Ann Arbor, Troy, and other surrounding growing neighborhoods. The Borland Group would love the opportunity to be part of Detroit’s changing landscape. Just as the Fisher Building withstood the test of time, so too has The Borland Group who has been in business since 2006. The Borland Group is a home grown real estate investment firm based in Livonia and is considered to be one of Michigan’s largest residential real estate buyers. Like the Fisher brothers who believed in giving back to the community in the form of creating jobs, so too does The Borland Group who plans on restoring this historic landmark, if acquired; thereby, bringing Michigan one step closer to its former self. It goes without saying that this auction will be a battle, but it is one that The Borland Group is willing to meet head on just as the ornate exterior of the Fisher Building met and weathered the elements throughout the decades. The Borland Group is ready to take the next step and expand its horizons into commercial real estate and is sure that the Fisher Building is the one to propel them into this new market.